In the summer of 1811, the first battalion of the 28th (North Gloucestershire) Regiment having returned to Gibraltar, set sail for Lisbon to march to join the second Battalion in 2nd Division. The men from 2/28th joined 1/28th, and the officers and NCOs of the former returned to England to recruit. 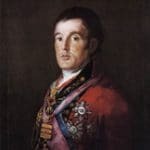 In October the 28th took part in Sir Rowland “Daddy” Hill’s neat little victory over the French under General Girard at Arroyo dos Molinos, and for Wellington’s 1812 campaign Hill’s Corps acted as a distant flank guard while Wellington captured the fortresses of Ciudad Rodrigo and Badajoz, and launched his offensive into central Spain. “Clinton, it is said, refused to wait till the troops on his right were re-formed, and hurried on the attack: it was growing dark, and a few more minutes of delay would allow the French to make off under cover of the night. Therefore he advanced at once, and found himself engaged at once in a most desperate musketry musketry contest. … ” Sir Charles Oman, “A History of the Peninsular War”. Picture: Wellington, painted by Goya.